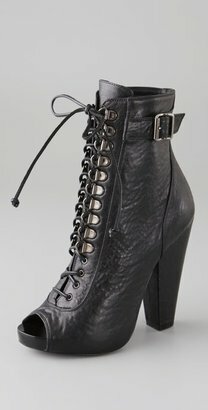 These open-toe lace up booties by Givenchy epitomize the edgy, aggressive overtone in Fall footwear, and cost a staggering $1,195 at Shopbop.com. While there may be better knock-offs out there, I think these Frenchie Lace Up Booties at Forever 21 are a good way to get this look for less at just $26.80. The zipper closure makes these easy to slip on and off, while the faux croc pattern adds some nice texture.